Anyone looking for information on Greece using the search engines and especially Google has probably come across the name of Matt Barrett. His Greece Travel Guide began as a hobby in 1995 and since then it has grown in popularity and size. 99% of the material in his guides was written by him. He doesn’t have a staff. He took all the photos, except for some of the historical ones. His Greece Travel Guides www.greecetravel.com (more than 5000 pages of free reliable information) are among the most popular travel sites on the web for the last Twenty-Three Years. His Athens Survival Guide www.athensguide.com is full of photos, stories and useful information which easy to use, it is the only Guidebook you will need and it is Free. It is also recommended by Travel Guru Rick Steves and even used by Athenians themselves. It has helped countless travelers to see the city as a place to visit and enjoy rather than to just see the Acropolis and get out. His History of Greece www.ahistoryofgreece.com is probably the most thorough, and colorful Greek history on the web and goes all the way to the present day. He has introduced little unknown Greek Islands to Americans and other foreigners who in the past would have only known about Athens and the mainland. He has done all this with a very simple formula: Honesty, Great photography, Humor and plenty of Free Information. By making the process of planning a trip to Greece enjoyable he has created a “Form of Entertainment“ and visitors to his site can spend weeks following links through a labyrinth of pages about Greek art, music, food, archaeology, and of course traveling! 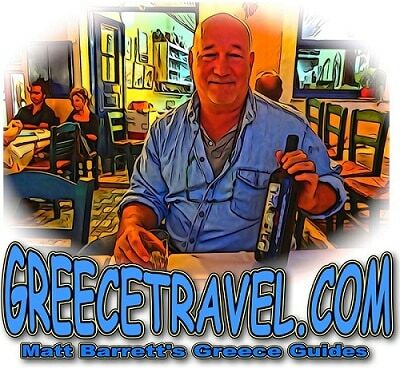 Matt Barrett’s Greece Travel Guide is a perfect way to plan your trip to Greece and the Greek islands. Just check it out! !